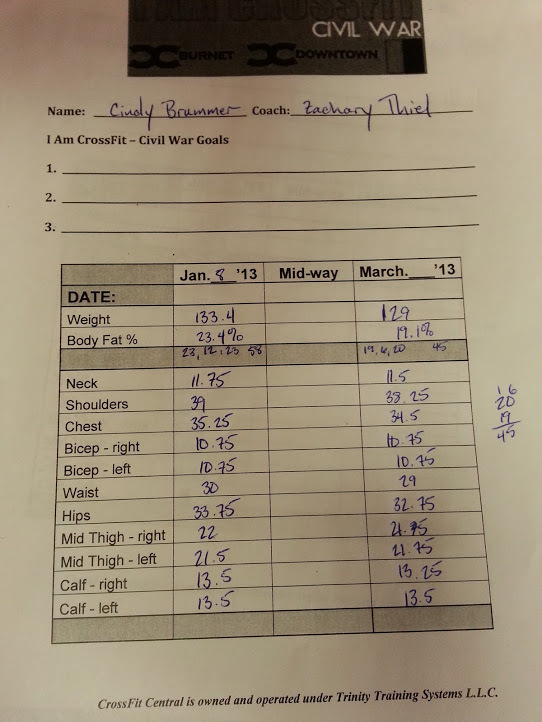 It’s been over a week since the 2013 I AM Crossfit Challenge ended, and I think it was probably my most successful challenge, even though I only hit one of my goals. This was the first challenge where I wasn’t pregnant or nursing, and I tried to follow the nutrition very closely. I did not Zone my food, but I did follow the Whole 30 guidelines really closely and watched portion sizes. I also did every extra workout I was supposed to do. It was a lot — I added in two extra met-cons a week plus an endurance WOD. By the time we hit week 8, I was ready for it to be done and tired of having to fit it all in. But now, I kind of miss it. I had set a pullups goal and a body fat goal. I did not get my pullups. I just never worked on them outside the gym. But I did get my body fat under 20%, so yay me! But there were definite benefits that I achieved outside of my goals. I am a stronger and faster runner. I broke my gum habit ( I was chewing a pack a week!). I also broke my sugar tooth. I still haven’t indulged in dessert, and to be honest, I don’t really want it. Fruit is sweet enough. I may have undone some of my efforts at SXSW this year. But not like last year. Last year I went crazy with the food. This year, aside from a few meals with rice or tortilla chips, I was relatively restrained. Yes — it was a good challenge. Just the benchmark alone is a good indication of how much I improved. I barely finished the first time — with a time of 11:58. On March 9, I crushed my old time — finishing in just over 10 sec. I was among more than 100 people this weekend who began Crossfit Central’s I AM Crossfit Challenge. It’s my third time to take on this 8 week challenge. The path is familiar, but even though I’m not new to it, it’s exciting and daunting all the same. I feel kind of like how I always did at the beginning of the school year — oh those many years ago. Back then, I wondered what it would be like, what I would learn. My notebooks were all new and fresh and full of opportunity. I always loved that, despite how nervous if inevitably felt about meeting my classmates and teachers. I’m trying hard to imagine what things will be like in 8 weeks when I look back. What do I want to look like? How do I want to feel? I can’t quite put it in words, so I’m having trouble coming up with my goals. Deep down I want this physical challenge to bleed into the rest of my life. I want this energy to feed into my family and my career in a way I don’t know how to explain. Confidence? Determination? Inspiration? I’ll have to work on those goals into something I can measure and just have faith those other things will happen naturally. Everything took place at Crossfit Central’s new downtown location, which is really nice. It’s a hike for me, so I’m not going to switch my class anytime soon, but it’s still really nice. Somehow there was a glitch, and I wasn’t on the list when I signed in for the benchmark WOD on Saturday. I wasn’t alone, but the coaches were super awesome and worked us in. Lisa Thiel even went around asking if there were folks who would switch with us so we could get into a an earlier heat (since we had kids and needed to be home). I quickly got into Heat 2 thanks to Michael, who agreed to wait an extra hour until Heat 6 (Thanks, Michael! You rock!!!) They took our “before photo”, some video of me doing a hang power clean for a future video, and then we warmed up with Zach. Then the coaches came for us. David was my judge. He set up my bar, but there wasn’t a lot of time, and I had to tell him what band I needed as I was running to the start line. Our run was on the sidewalk along the I-35 access road. At one point a big truck hauling a trailer on the interstate dragged the trailer along the guardrail and a bunch of wood came popping off down the concrete wall. It didn’t hit the access road, but it made me run a little faster. The humidity was high, and my grip strength was for-s**t because of Thursday’s workout of 250 kettlebell swings for time. I felt like I couldn’t hold on. It was totally motivating to hear people cheering for me — not just my judge and Linda, but also several of the other coaches as I was running back into the gym. I’ll be posting those goals soon. I may only have two. But that will just help me focus. You can’t see me in this picture unless you can find my curls. See me? I’m way over the the left behind the guy with the black beard. Well anyway — last night was the kickoff meeting to the challenge I’ve been writing about for so long you’re probably thinking — didn’t she do that already? Haha! I’ve got a great team, a great coach, I’m super excited, and I kicked it off with a bang! This morning was our benchmark WOD. It’s the same as last year. If you’ll remember — I sucked air in last year’s kickoff. And I found out I was pregnant the next day. I barely finished the finale WOD and burst into tears because finishing had been a goal. How did I fare this year? After pregnancy and birth and all that? That 30 seconds off my finale time last year — a PR!! I gotta admit — I was pretty nervous. The WOD is a gasser! It wasn’t easy, and got really hard by round 2. I know I can beat that time. I will!